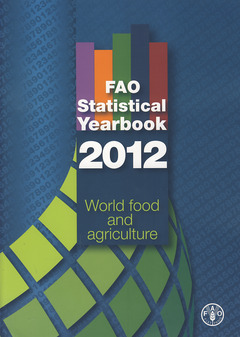 The 2012 edition of the FAO Statistical Yearbook represents a break away from FAO tradition. Through employing data from global statistical providers, including FAO, the publication presents a visual synthesis of the major trends and factors shaping the global food and agricultural landscape and their interplay with broader environmental, social and economic dimensions. In doing so, it strives to serve as a unique reference point on the state of world food and agriculture. The book is subdivided into four thematic parts, where an attempt is made to exhaustively present the spectrum of issues relevant to the subject matter. Part 1 : The setting measures the state of the agricultural resource base, by assessing the supply of land, labour, capital, inputs and the adequacy of infrastructure, and also examines the pressure on the world food system stemming from demographic and macroeconomic change. Part 2 : Hunger dimensions gauges the state of food insecurity and malnutrition, measuring the multitude of dimensions that give rise to hunger and those that shape undernourishment. Part 3 : Feeding the world evaluates the past and present productive capacity of world agriculture together with the role of trade in meeting changing food, feed and other demands. Part 4 : Sustainability dimensions examines the sustainability of agriculture in the context of the pressure it exerts on the environment, including the interaction of agriculture with climate change, and how it can provide ecosystem services in relation to the bio-based economy.